They’re called “sweet” ants because they emit a nauseatingly sweet rotten coconut odor when they’re crushed; but if odorous house ants invade your New Jersey home, experienced Monmouth County NJ ant extermination professionals warn that you’ll find the experience more sour than sweet. Odorous house ants have become the most common and most difficult to control ant species in New Jersey. About 1/16 inch long, or about the size of a single letter on this webpage, they live in massive multiple colonies that can number in the hundreds of thousands. Their minute size, prolific numbers and swarming behavior make odorous house ants a formidable foe when they invade Ocean County NJ homes. To get an idea of the invasive force of these small insects, imagine every letter on this webpage suddenly turning into a tiny dark brown ant and swarming en masse over your kitchen counters and into your cupboards! Odorous house ants are so tiny that they can easily slip into sealed food boxes and plastic containers, fouling the contents; although you’re more likely to see them swarming in a writhing mass over dropped food or plates of food left on kitchen counters. Should you discover a trail of odorous house ants snaking across your kitchen floor and into the trash can, your first instinct may be to reach for the insect spray. Don’t! While household sprays will kill a few dozen ants, you’ll force the colony to relocate, making it even harder to eliminate. Expert Monmouth County NJ ant exterminators have the knowledge and tools to get rid of odorous house ants and keep them from coming back. The odorous house ant is also known as the coconut ant or the stink ant. These pests are appropriately named due to the stink that they emit when they are crushed. The odorous house ant is very pesky and difficult to eradicate once it invades a human dwelling report Monmouth County, NJ exterminators. On the exterior, odorous house ants build their nests under stones or in wood or debris pile. These types of ants will be found traveling both individually and in trailing formation. If you unearth a odorous house ant nest, the pests will scatter, grabbing any eggs that they can save. Some ants will react in a defensive mode by standing on their back legs as if ready to fight until the death. Odorous house ants often enjoy large colonies with over 10,000 members. One reason that these ants have been successful at making large nests is because they have many queens producing eggs for the colony. It is not uncommon for large nests to be split into multiple locations. Once odorous house ants have found their way indoors, these ants will feast upon any type of human or pet food that they encounter. Like other types of ants, the odorous house ant leaves a pheromone trail as it travels so that other ants are able to find their way into the chow line. Pheromone trails can be interrupted by using soapy water to sponge up the stinky invaders. Using store bought pesticides will kill odorous house ants on the surface but they will not reach into their nesting areas behind cabinets, in wall voids and under flooring. A Monmouth County, NJ exterminator will be able to provide a protective barrier against these pests so that their chance of entering a home or business will be eliminated. Their technical name is “Tapinoma sessile” but most people just know them as an annoying ant that can survive both inside and out. The “odorous house ant” comes by its name with good reason because of the stench it emits when you squish it. Doing so will reward you with a whiff of rotting coconuts. The odorous house ant is a hardy ant which will live in massive colonies both indoors or outdoors. Two or more queen ants work tirelessly to produce more than 100,000 worker ants and hundreds of reproductives. Like many other ant species, odorous house ants feast upon the honeydew that is produced from mealybugs and aphids. These ants work 24 hours a day, 7 days per week for the good of the colony. 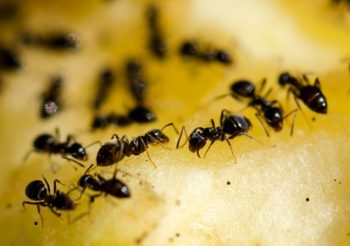 During the early fall when honeydew is hard to come by, New Jersey homeowners often come under attack by an army of odorous house ants as they search for a replacement food source. As the autumn arrives, these hungry ants will change their diet and consume dairy products, vegetables, meats, sugary foods, fruit juices, sweets, pet food, or any other food substance made available by humans. As these pests hunt for food, they contaminate food sources and preparation areas. Once odorous house ants find their way indoors, they will not leave on their own unless Argentine ants force them to move out, which would make for an entirely different ant nightmare. Hiring a Monmouth County, NJ exterminator to create an exterior barrier against all types of pests will keep odorous house ants from nesting in walls, under flooring, and behind cabinets. The slightest bit of warmth has brought hoards of pesky odorous house ants to the earth’s surface once again. They arrive seemingly from nowhere. Outdoors, massive amounts can be found while homeowners are gardening report Monmouth County, NJ pest control professionals. Their colonies exist in mulch piles, under slabs of cement, in firewood, in piles of logs, beneath stones, or under sidewalks. The odorous house ants that come indoors are the more experienced older ant foragers. They tend to appear out of nowhere and often time in large numbers. Odorous house ant like making their nests within a structure as there is ample places that they can reside with minimal disturbance and typically a plentiful supply of food sources. These ants will create nesting sites throughout buildings in wall voids, under flooring, behind baseboards, in wood frames, in attic insulation, in crawlspaces, behind cabinets. The odorous house ant is also called the “sweet ant”. They likely received their name due to the fact that they like to consume sweets. The honeydew that aphids create is a favorite food source for the odorous house ant, as well as many other species of insects. Odorous house ants that exist in the forest do not typically have a large nesting site. These ants typically have one queen and approximately 100 worker ants in the colony. In contrast though, odorous house ants that live within a structure, or those that live near homes, often do have extremely large colonies with many different branches of colonies. In addition, those odorous house ants also tend to have hundreds of queens and millions of workers within one single main colony. Homeowners have a difficult time eliminating odorous house ants without the help of a professional Monmouth County, NJ pest control professional like Allison Pest Control.